She's finally done! Thought that was taking forever, huh? So did I! All that work on the miniatures and Lucy, now Lani, just sat patiently on the floor and watched the painting mania. I changed her name to Lani because my husband insisted that Lucy was NOT an islander's name! Ok, I said, YOU pick a name that rhymes and has only four letters...Lani it is! Anyway... here she is! Lani is in love but she isn't telling. 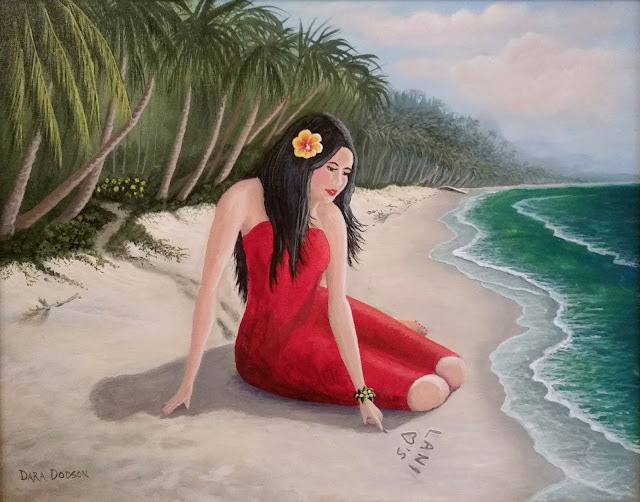 She has come out to write his name in the sand, soon to be washed away by the tide.